Posted under Health Guides. Updated 1 August 2018. Seasonal allergies, also known as “hay fever,” affects almost 50 million people in the U.S. alone. Seasonal allergies (also called “hay fever”) are certain conditions that trigger an allergic response. People who have seasonal allergies usually have an allergic reaction when they come in contact with pollen from certain trees, grasses, weeds, and/or mold spores. Most people can be around these substances; however, people who have seasonal allergies often have symptoms which can last most of the spring and summer months. Anyone, no matter their gender, race, age or where they live can have seasonal allergies. These conditions often run in families so it is likely that you know someone else who is close to you that has similar symptoms. Symptoms often start when a person is a child or young adult and can last a lifetime; however, symptoms usually get better with time. The most common symptoms of seasonal allergies are: stuffy and/or runny nose, itchy eyes, coughing or sneezing, mild sore or scratchy throat, and itchy ears. If you have asthma, it may be triggered by seasonal allergies. Allergies happen when a person’s immune system, which normally fights infection and keeps you healthy, reacts to something(s) in the environment as a threat to the body. When this happens, it triggers an immune response. When do people get seasonal allergies? People who have seasonal allergies most often complain of symptoms in the spring and summer months; however, symptoms may also occur in the fall or winter months, depending on where you live. 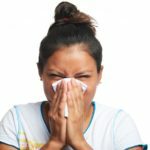 How can I tell if I have a cold or if I have allergies? Sometimes it may be hard to tell if you have a cold or whether your symptoms are caused by an allergy. However, if you have a sore throat, body aches, and/or a fever along with coughing and sneezing, it is more likely that you have a cold or the flu. If your symptoms don’t get better or you have a fever of 101 or higher, you should call your primary care provider. What are some ways to treat my seasonal allergy symptoms? Seasonal allergy symptoms may be treated with one or more treatments such as simple nose rinses, over-the-counter medicine and prescription medicine and/or allergy shots or pills. Ask your health care provider which treatment(s) is best for you. Nose rinses and nose sprays: Your health care provider may suggest cleaning the inside of your nose with salt water. Water with added salt is placed in one nostril. As the water flows out through your other nostril (opening on the other side of your nose) so does any pollen or irritants. Ask your HCP if a nasal rinse would be helpful and if so, how to do it. If your nose is very irritated from seasonal allergies, your HCP may prescribe a steroid nose spray. Nasal sprays usually help with seasonal allergy symptoms but they can take a few days or even a week before they start to work. Antihistamines: The most common type of medicine to treat seasonal allergies are called antihistamines, and they may be taken as a pill, liquid, eye drop, or nasal spray. Common oral (taken by mouth) antihistamines are Zyrtec® (Cetirizine), Claritin® (loratadine), and Benadryl® (diphenhydramine). These medicines are used to treat general allergy symptoms, whereas eye drops and nasal sprays will give you “local” relief (just to your eyes or nose). Antihistamines are available over the counter, but also in prescription-strength doses. Some antihistamines cause drowsiness (make you feel tired) and should only be taken at night. Check with your primary care provider to find out which antihistamine is best for you since some can interact with other medicines that you might be taking. Allergy shots: Allergy shots are also called “immunotherapy.” If prescription medicine doesn’t improve your symptoms, after a while, your primary care doctor may have you see an “allergist” (a doctor who specializes in taking care of people with all kinds of allergies). Your allergist may suggest allergy shots. This is a long-term treatment that involves getting weekly or monthly allergy shots. This treatment can take up to many months or even a year to see results. SLIT: SLIT stands for “Sublingual Immunotherapy” which is the newest alternative to allergy shots. SLIT is a pill that is made up of “extracts” of what a person is allergic too, which is similar to allergy shots. The pill is placed under a person’s tongue. After a couple of minutes, the person swallows the pill. SLIT must be prescribed by an allergist only after allergy testing is done. Can I prevent allergy symptoms? You may be able to prevent or at least lessen allergy symptoms if you know which pollens you are allergic to. Check the pollen count and avoid spending a long time outside or having windows open when these counts are high (you can check the local pollen count online or in a newspaper.) Shower and wash your hair (to rinse off pollen) after spending a lot of time outside. If possible, use an air conditioner and keep windows closed, especially at night while you’re sleeping. What if I have severe allergy symptoms? Ask your health care provider if you should start your medicine about 2 weeks before you usually get seasonal allergy symptoms. While seasonal allergies can be uncomfortable, there are things you can do to ease your symptoms so you can still enjoy being outdoors! Be sure to let your health care provider know how you’re feeling and what seems to make your symptoms better or worse.